FBI Director Christopher Wray has launched a staunch defence of the agency following criticism by US President Donald Trump. Mr Wray told a committee of lawmakers that there was "no finer institution". Mr Trump recently lashed out at the federal law enforcement agency, saying its reputation was "in tatters". Special Counsel Robert Mueller, a former FBI director, is investigating alleged Russian interference in the US election to help elect Mr Trump. Mr Trump denies that his team colluded with Moscow. 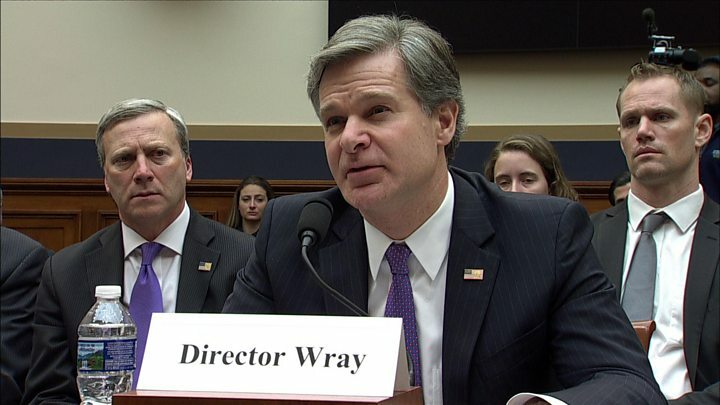 "There is no finer institution than the FBI and no finer people than the men and women who work there and are its very beating heart," Mr Wray told the House of Representatives judiciary committee. FBI Director Christopher Wray was the man testifying before the committee on Thursday morning, but - at least for the Republican congressmen present - it was special counsel Robert Mueller in the spotlight. In particular, the Republicans honed in on a former member of Mr Mueller's team, Peter Strzok, a top FBI counterintelligence officer removed from the investigation this summer after the agency discovered he had written negative text messages about Donald Trump during the 2016 presidential campaign. The strategy is clear - to raise doubts about the impartiality of Mr Mueller's investigation. The president's supporters for months have been pointing to perceived Democratic leanings of some of the investigative team, including a handful of donations made to Democratic candidates. Mr Strzok - who participated in the interview of Trump confidante Michael Flynn as well as the investigation into Hillary Clinton's use of a private email server as secretary of state - has now become the most-cited example of possible bias. Conservative officeholders and commentators are steadily sharpening their criticisms of Mr Mueller, a former Republican-appointed head of the FBI. As his investigation proceeds, and the list of presidential associates facing criminal charges grows, this partisan pressure is sure to mount. Republican committee members pressed Mr Wray on alleged bias within the FBI. He responded by saying that all organisations made mistakes but "independent processes" at the FBI would look into the facts surrounding any mistakes and FBI employees would be held accountable if "appropriate". Reports emerged last weekend that Mr Mueller had dismissed an FBI officer from the investigation after he was discovered to have made anti-Trump remarks in text messages. The president seized on the officer's dismissal and, in a tirade on Twitter, said the FBI's "reputation is in Tatters - worst in history! But fear not, we will bring it back to greatness". Mr Trump also reiterated his denial that he asked former FBI director James Comey to drop an investigation into the conduct of Michael Flynn, the president's former national security adviser. Mr Flynn announced a week ago that he was co-operating with Mr Mueller's investigation. He admitted lying to the FBI and, in return for pleading guilty to a lesser charge, was offered a reduced prison sentence of six months. Analysts say the deal indicates Mr Flynn has incriminating information about one or more senior members of the Trump administration. 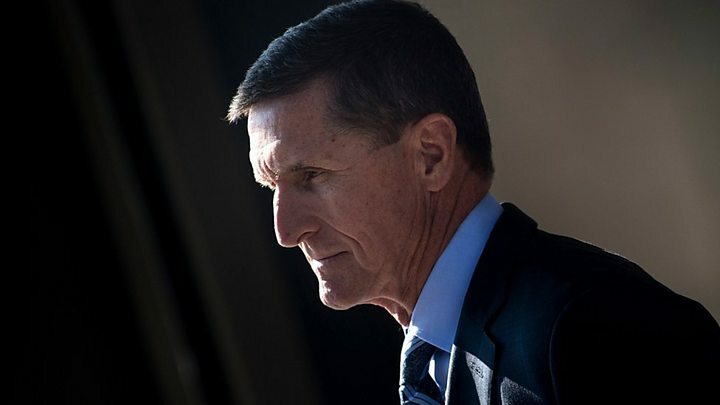 Media captionAfter Flynn's guilty plea, what next for the Russia investigation? Mr Trump has repeatedly criticised the FBI for not taking action against his election rival Hillary Clinton. Mrs Clinton was investigated by the FBI after it emerged she had used a private email server to conduct state department business. No charges were brought against Mrs Clinton or her team.